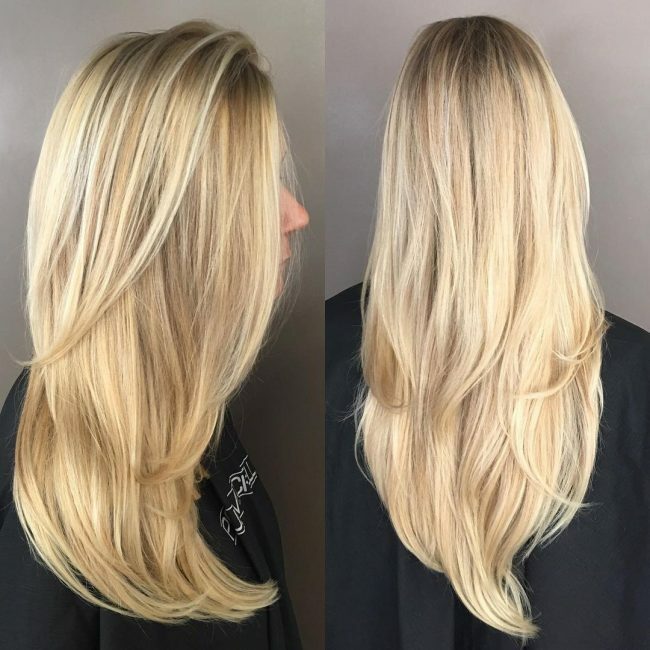 Blonde balayage is perfect for any woman who wants to give her strands a natural looking coloring because it is not noticeable when the hair grows out. 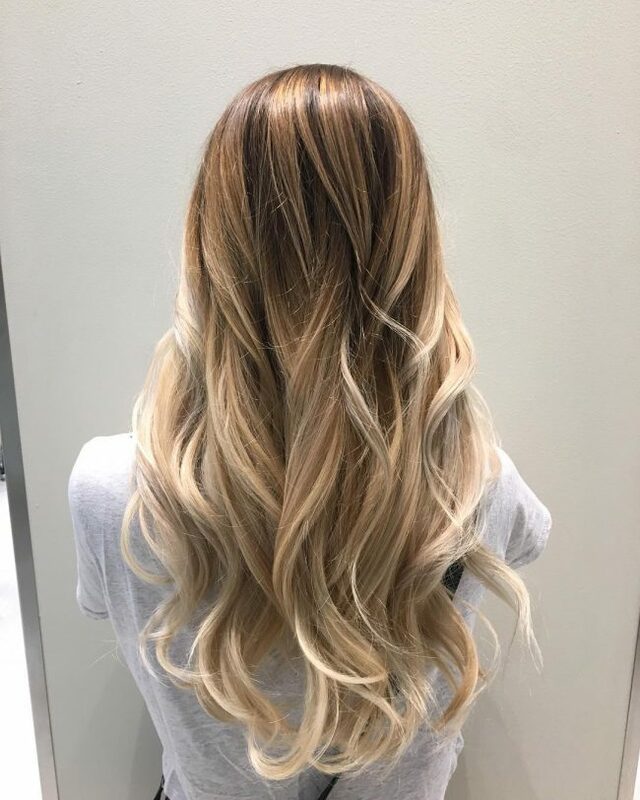 The best thing with this color technique is that you can always have a unique appearance by combining one of the many shades of blonde with browns. You can also use this freehand hair painting technique to create a beautiful ombre or sombre design. However, to look good in this style, you have to choose the right color combinations and also something that goes with your skin tone. Look through the gallery below for some ideas on how to achieve this elegant hairdo. The shadowed roots in this design form an excellent foundation for the beautiful hand painted shades. 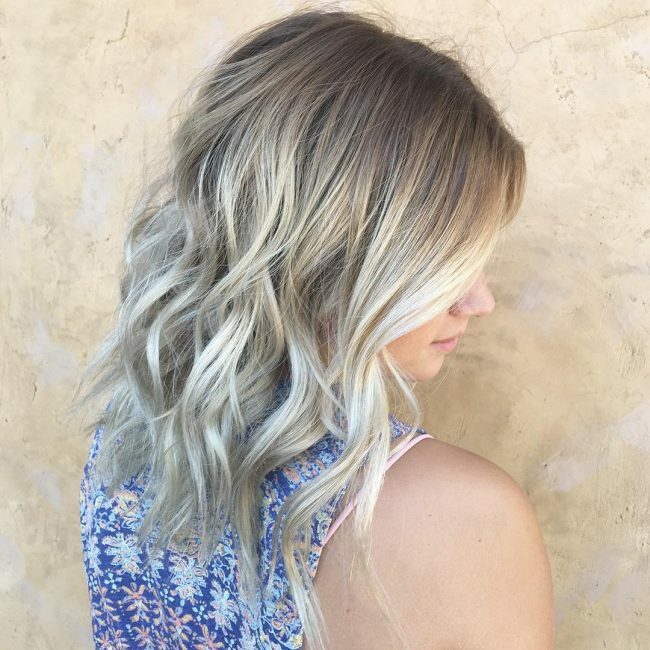 However, the choice of colors is still what makes this a top notch hairdo and it entails blending a bright silver ash blonde with a soft brown hue to form a unique shade. The hair also has a lovely textured haircut and a cute face frame styling that also helps to enhance the overall appearance. Ombre is a beautiful color pattern, and it is what makes this headdress look outstanding. 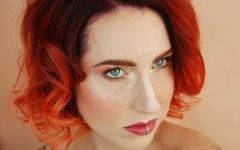 The style entails transitioning from a dark chocolate brown base to a sweet strawberry blonde shade to create a beautiful contrast. These thick locks also have some lovely swirls that help to add some depth to the hand painted shades. The size of your strands does not matter when it comes to freehand painting because even shoulder-grazing ones like these will still look adorable. They have a beautiful coloring with a smooth transition from the light brown base to a lovely summer blonde hue. It is amazing how the different shades in this design melt to give the strands a unique tone. 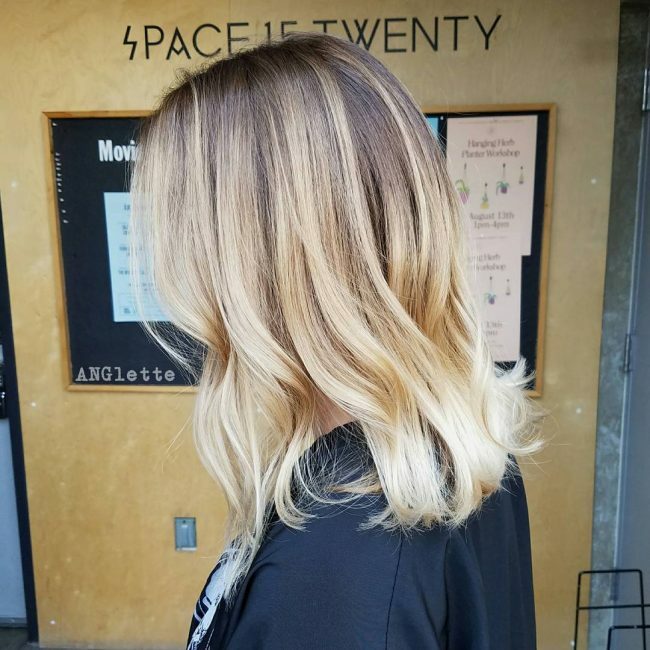 You can only achieve such a perfect color melt by using balayage to dye your strands, but the color choice is also crucial. 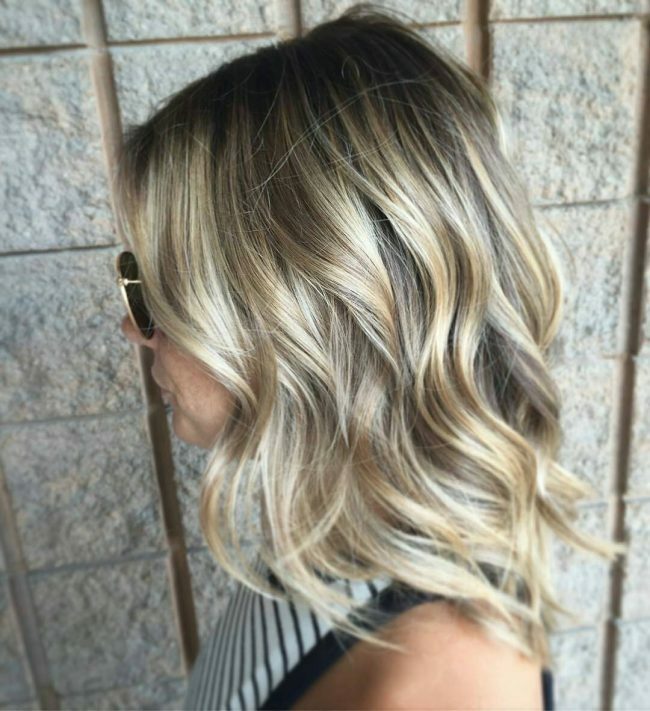 In this style, the shades are creamy blonde, and a light brown hue and they blend well to give the loose waves a distinct tone. One cannot overemphasize the importance of choosing the right shades when it comes to balayage as this is what will make you look charming. The hues in this design are perfect, and they are also in a lovely ombre pattern. 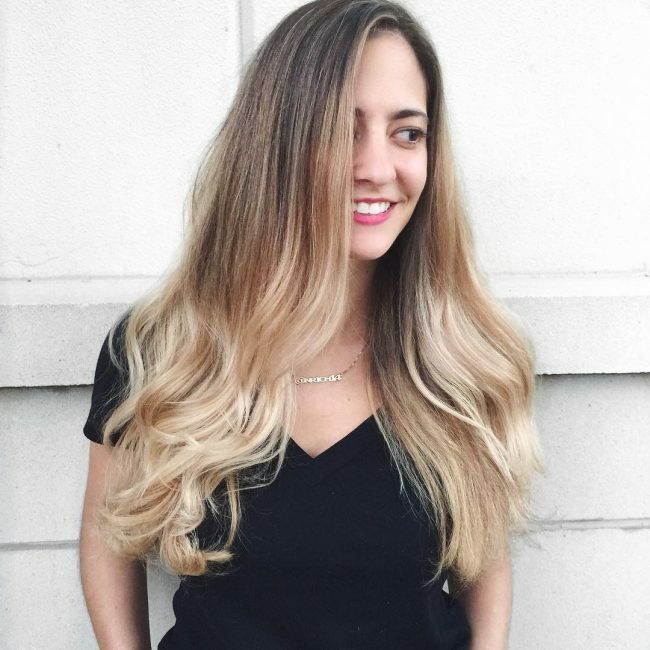 This style entails transitioning from a dark chocolate brown hue to a dazzling golden blonde to create a perfect ombre design. If you would rather go with a bright hair look, then this summer design is perfect for you. 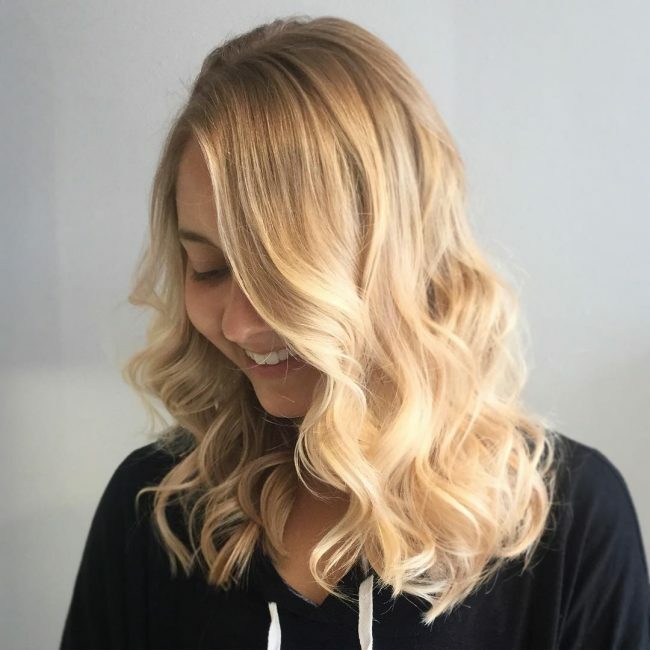 It is a simple design but still a breathtaking blonde balayage dyeing that entails introducing a hint of brown to a bright natural blonde shade to create an adorable hairdo. You can never go wrong with a freehand painting provided you choose your colors well. 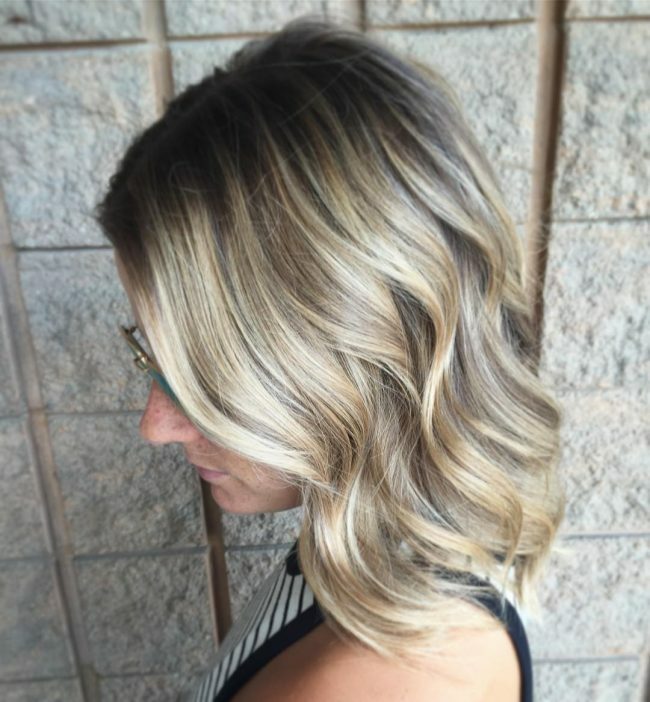 And this style proves this because the baby blonde is impeccable and it blends with a soft brown hue to create an eye-catching color pattern. If you combine the lovely shade with dark roots, you will look magnificent. 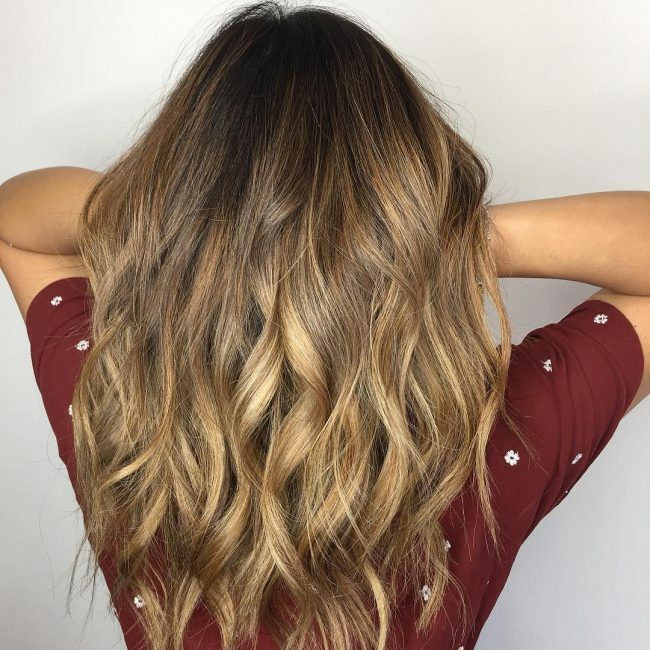 The best thing with balayage is that you can keep it for as long as you wish because all that you need to do is to give it an occasional touch up to take care of the growing out. In this style, this entails introducing a honey blonde shade to the long hair and finishing the style with a blowout. 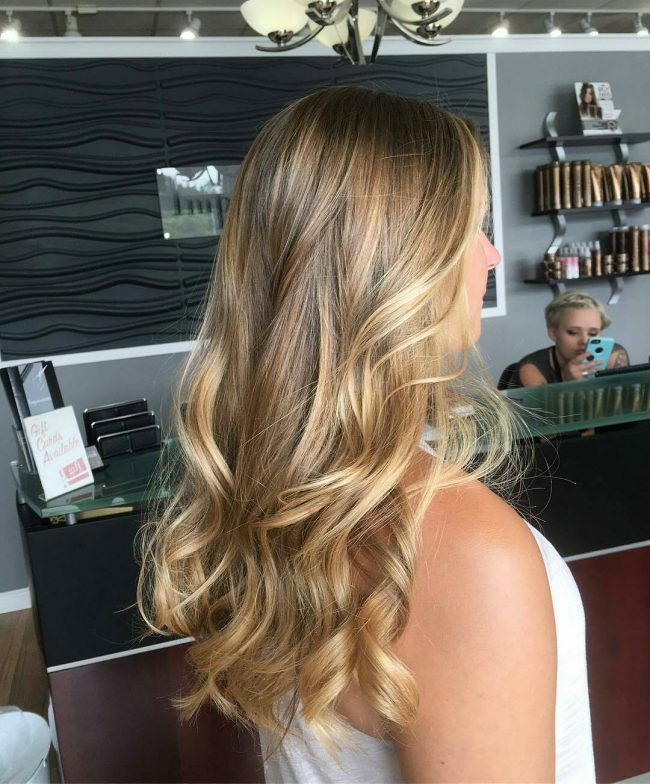 Contrary to what most people think blonde balayage also works for short hair, and so it is not necessary to have a long mane. 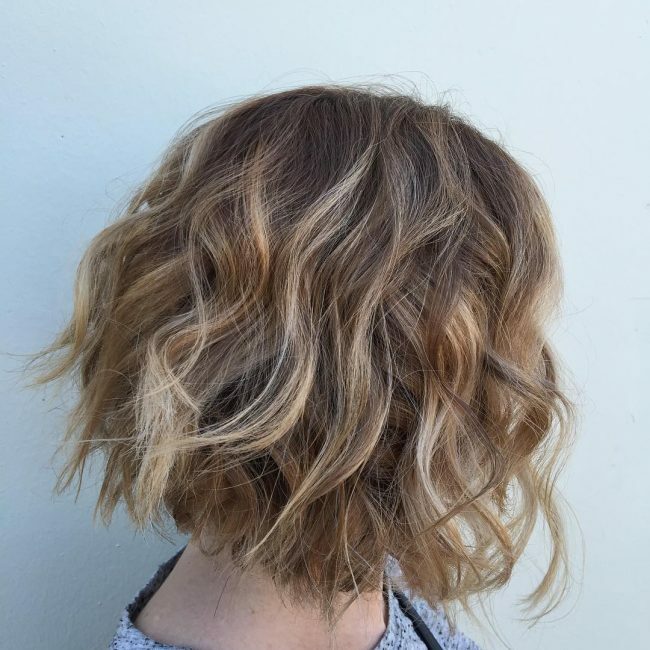 In this particular style, the haircut is a short textured bob, but the introduction of the hand painted beige blonde streaks is what makes it look exquisite. This hairdo entails maintaining your natural brown shade on the base and then brightening it up the ends by hand painting them with a blonde shade. You should then finish with a simple layered brush back to add some depth to your beautiful color. Shadowing the roots is perfect when you want to give your design a slight contrast, and it works perfectly well for this hairdo. The natural blonde locks already have a beautiful shade and so apart from shadowing the roots, you only need to enhance the tone with a champagne finish. These strands may not have a perfect volume but their excellent texture, and flawless color design makes this hard to notice. However, the balayage color is the highlight of the look, and it comes from blending and baby blonde shade with honey brown. The bright and sassy look of this headdress comes from hand painting a creamy hue to the natural brown beach waves. 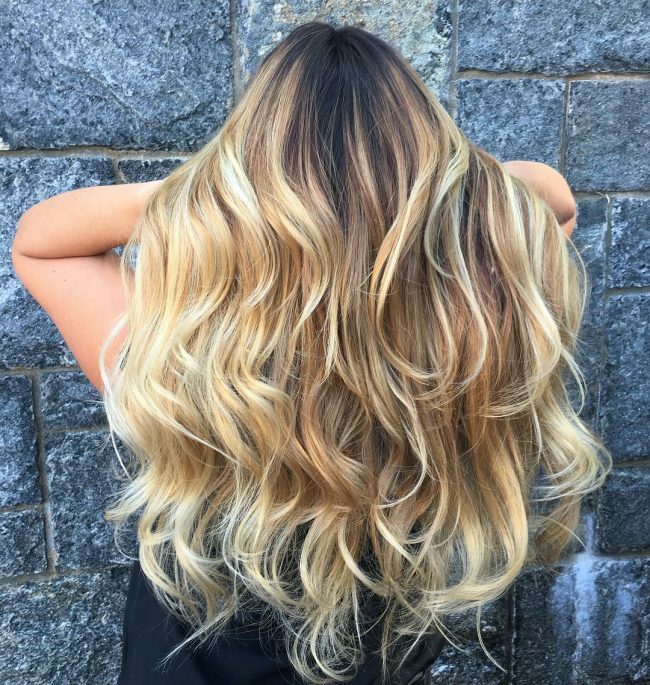 These wavy locks also have a flawless cut and a layered styling that helps to show off the contrast pattern the balayage colors. Warm summer tones like the ones in this design will make you look and feel great. They are also not as difficult to achieve as they appear because you only need to give your hand painted strawberry blonde hue a tangerine twist. 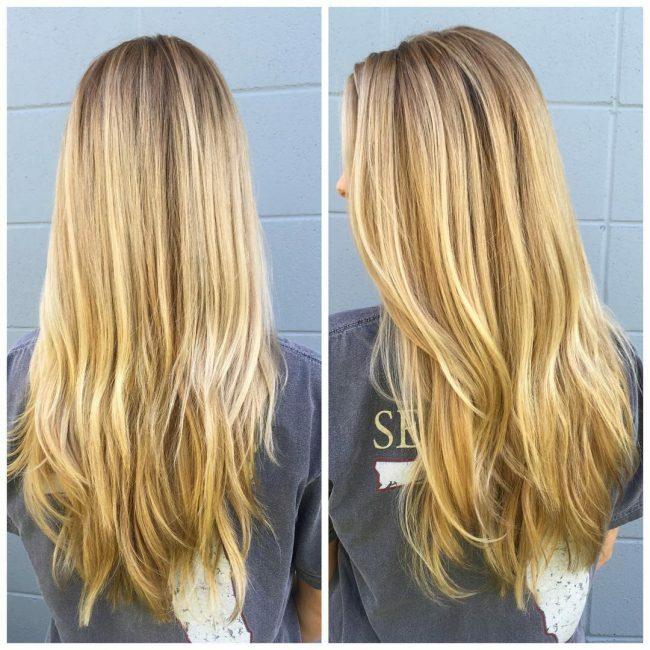 Having some balayage highlights throughout your long hair is a perfect idea if you want to have a distinct headdress. These strands have a dominant and natural dark brown shade, and so for the highlights to look good, you should hand paint the locks with a deep blonde shade. 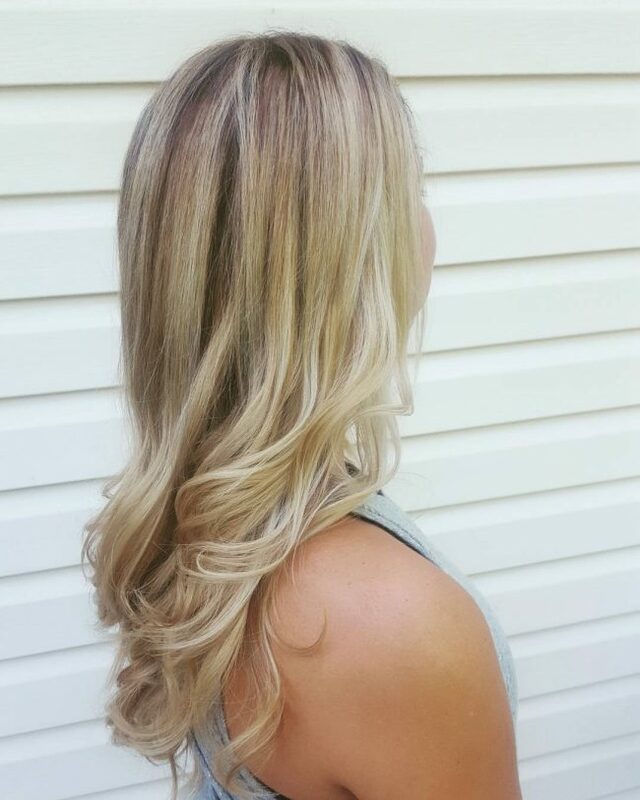 A natural looking coloring like this one is perfect for a lady that does not want to make it look obvious that she has some artificial colors on her locks. It entails introducing a subtle blend of caramel and blonde to her natural hue to create a beautiful sun-kissed appearance. 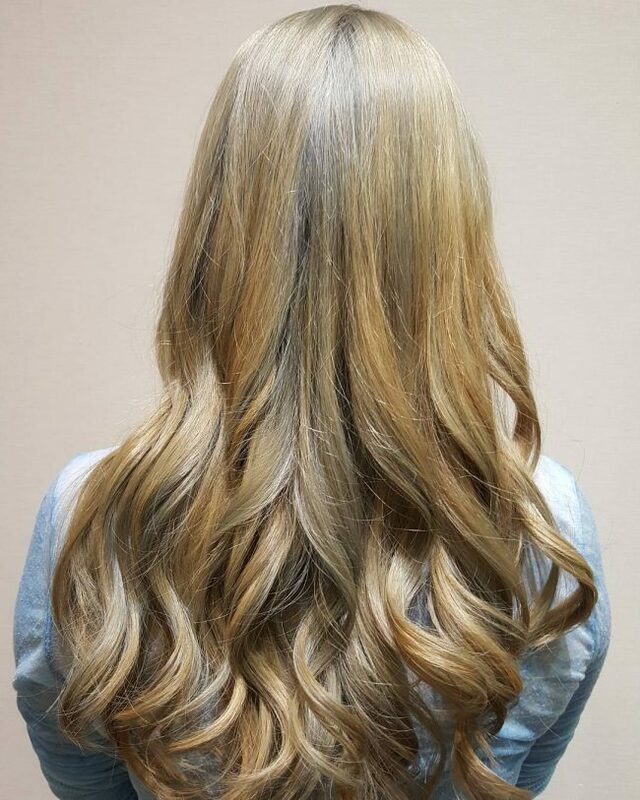 Ash blonde is a fantastic shade, and this look is what you get when you freehand paint it on your long brown mane. It has a beautiful and soft feel that will make your strands look amazing, and it looks even more appealing if you have good volume and some lovely curls on the lower half of the hair. Here is a neat appearance that you can create effortlessly on your long and textured face-framing locks. 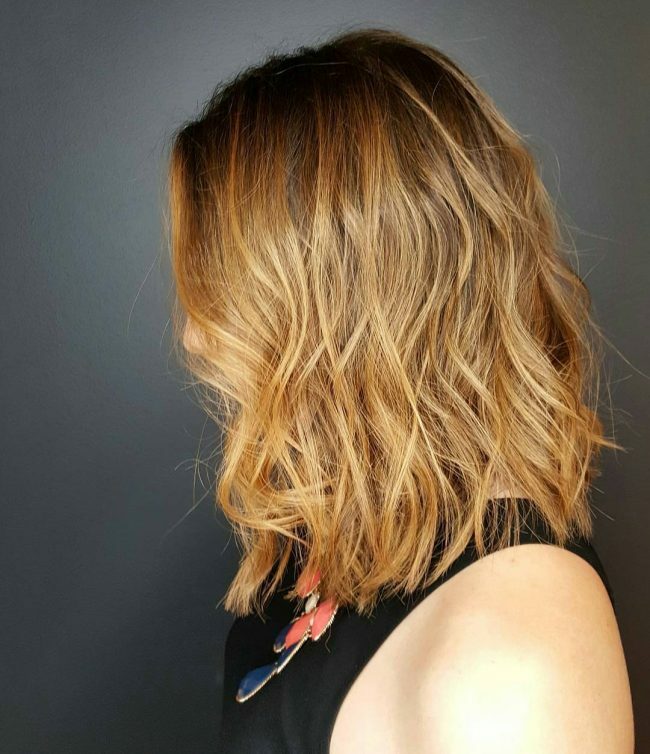 It is a simple design that entails transitioning from a dark brown base with shadowed roots to a typical summer blonde hue. The dazzle in the ashy blonde tone on this headdress is what makes it a perfect idea for your hair. To replicate this look, you should hand paint your long locks in an ombre design starting with honey roots and transitioning to the ash blonde shade for a perfect contrast. You should then give it a hint of a golden hue to get the incredible dazzle. It is vital to know how to use your colors if you want to look outstanding. 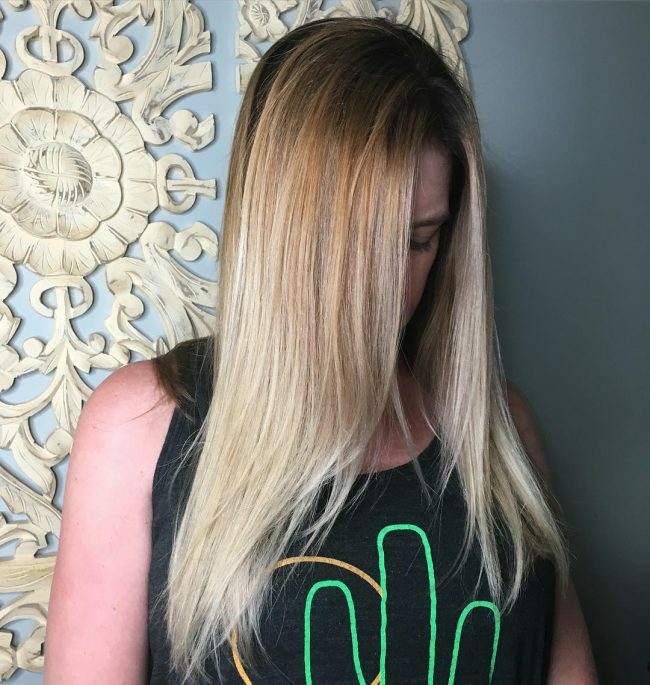 This design demonstrates how to use your shades well, and it entails introducing some light blonde balayage highlights to a honey brown to create a flawless color blend. Keeping things moderate is the way to go if you want a natural looking headdress like this one. 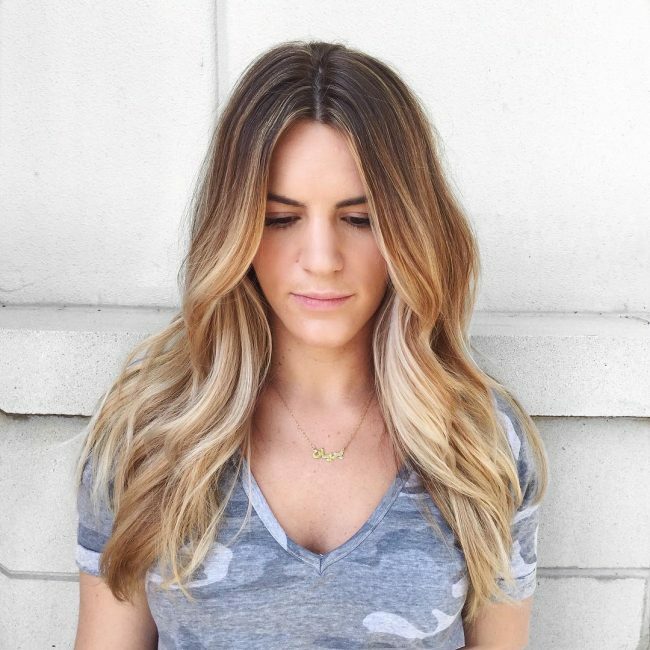 Here you only have to introduce a subtle balayage in an ombre pattern by transitioning from a brown base to a summer blonde hue. And if you have some shoulder-grazing textured locks like these a sweep back is all the styling that you need. This adorable headdress has a lovely styling that entails forming a face frame and layering the locks, but the Color is what makes is perfect. The dyeing involves introducing some soft strawberry blonde streaks to the brown hair to create a perfectly highlighted design. 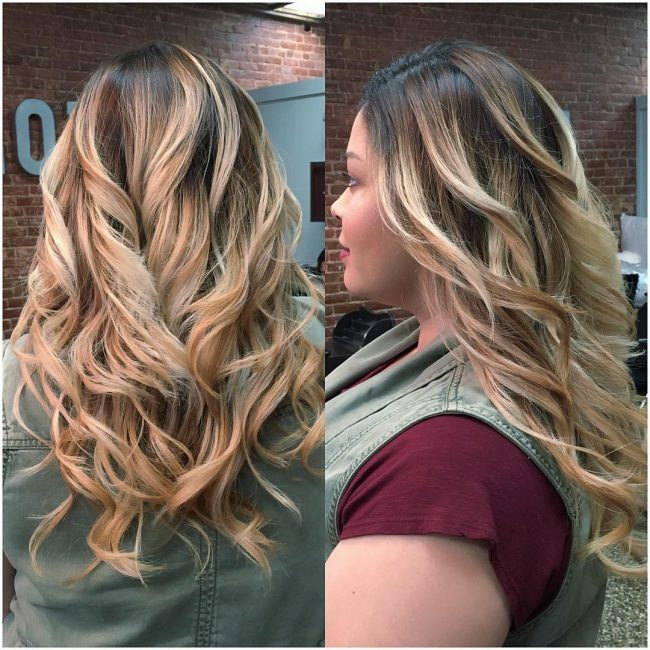 You can always be confident of a unique balayage look if you know how to use your shades. 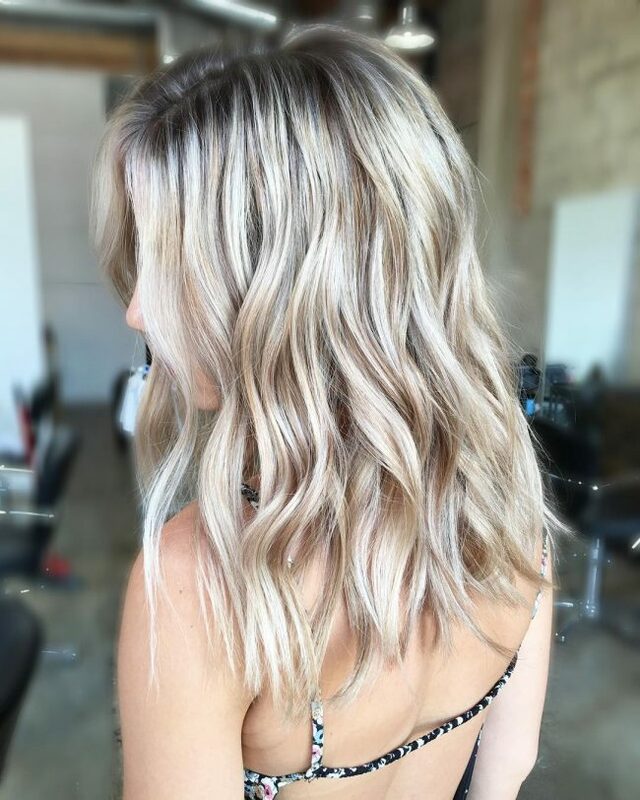 This style is not just about freehand painting but also blending the shades to give the loose curls a soft look by having some cute baby lights on the lower half of the hair. Some ladies will prefer to maintain their natural hair color, and this style is a perfect example of this. 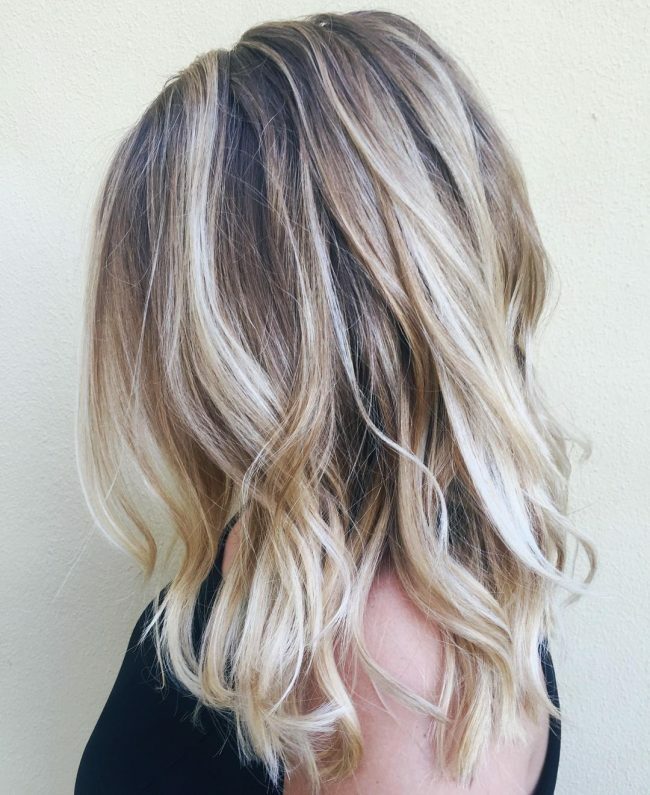 However, you can still create an adorable balayage design, and this hairdo achieves this by introducing some subtle blonde highlights to the long textured strands. Ombre is a beautiful color pattern, but this one is a class higher than the rest. And this is not just because of the choice of shades but also how the lady uses them. 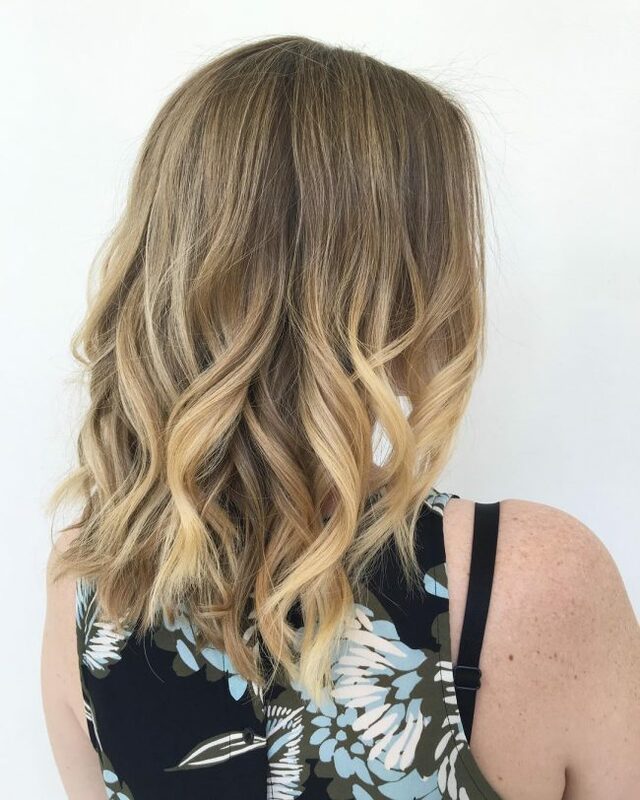 The style entails transitioning drastically from a golden brown base tone to a sweet summer blonde hue to create a flawless ombre balayage pattern. Freehand painting requires some creativity if you want to stand out from the crowd. In this design, the style is on a virgin hair with a natural black tone and all that you need to do is to introduce a light brown shade to the textured locks and finish it with icy tips. 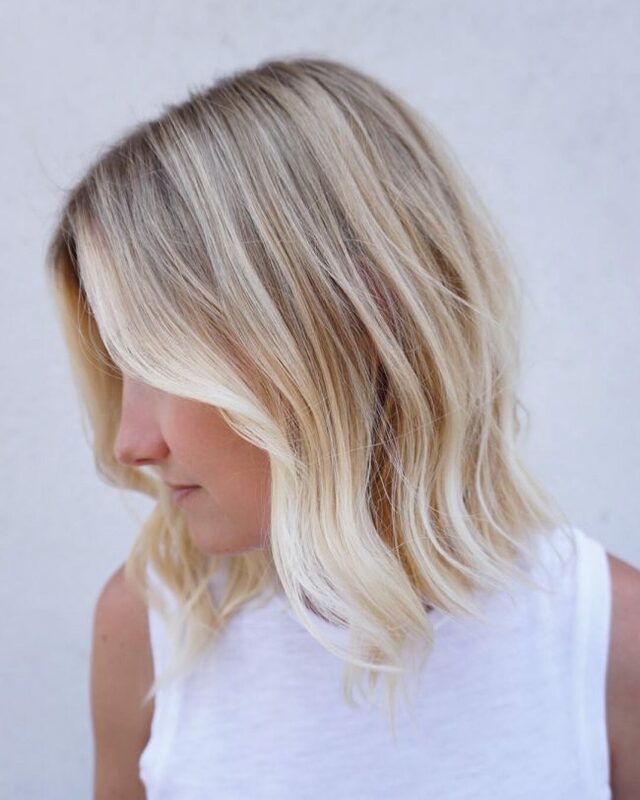 This long bob haircut has an appealing and natural appearance that not only comes from the cut but also its color. 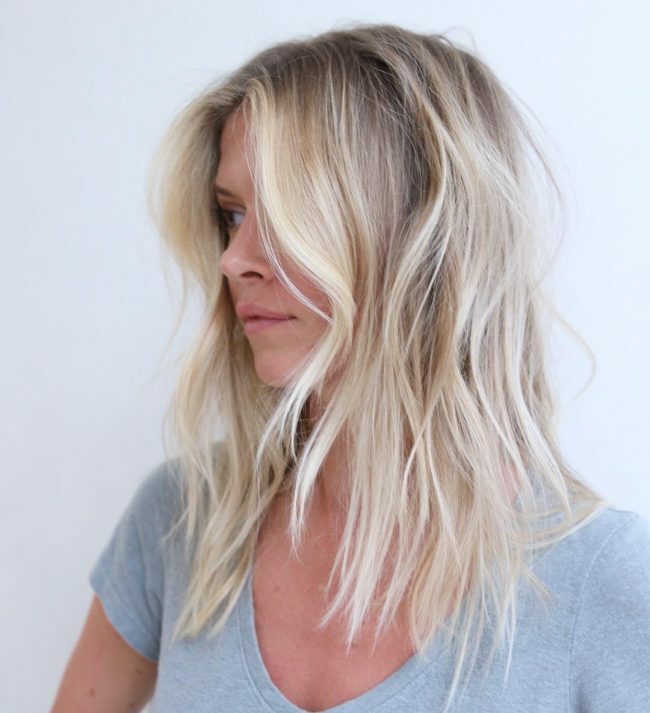 Its balayage shade is very straightforward because you only need to hand-paint a light blonde hue throughout the head and maintain an ashy brown tone on the roots for a slight contrast. Straight hair provides a perfect base for your colors, and this is what makes it ideal for balayage. However, this does not eliminate the need to have some lovely colors such as the chocolate and summer blonde in this style. 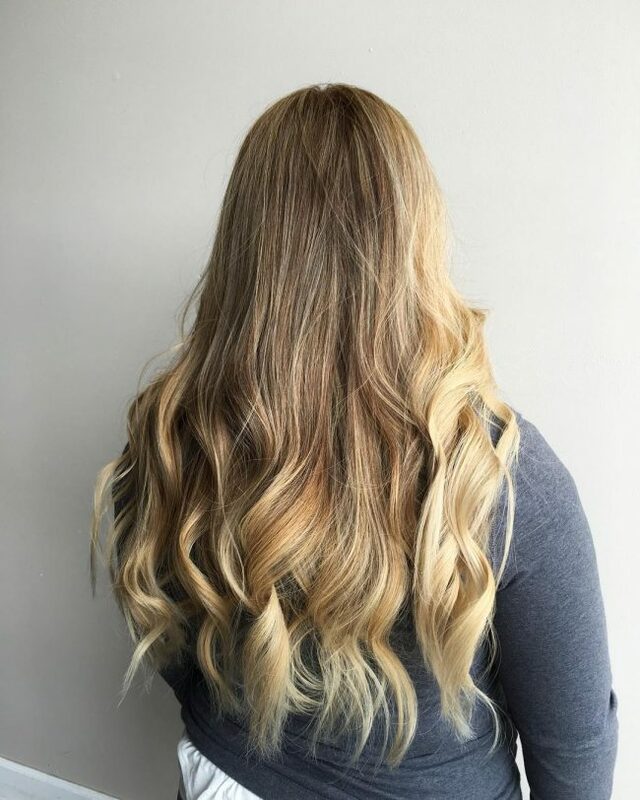 Here the chocolate forms the base shade, and it transitions in an ombre pattern to the summer blonde that is the most dominant shade in the design. The face frame style in this hairdo is perfect because it helps to show off the lovely shades. But, the colors are the center of attraction, and they are a caramel blonde on the roots that transitions to a blend of freehand painted light blonde and dark brown with the former being the most dominant of the two. Some colors like brown and blonde will always work well together, and this is regardless of the shades that you choose. The dark hues of the two shades in this style blend perfectly to create a lovely tone that you can only achieve by freehand painting these shades. 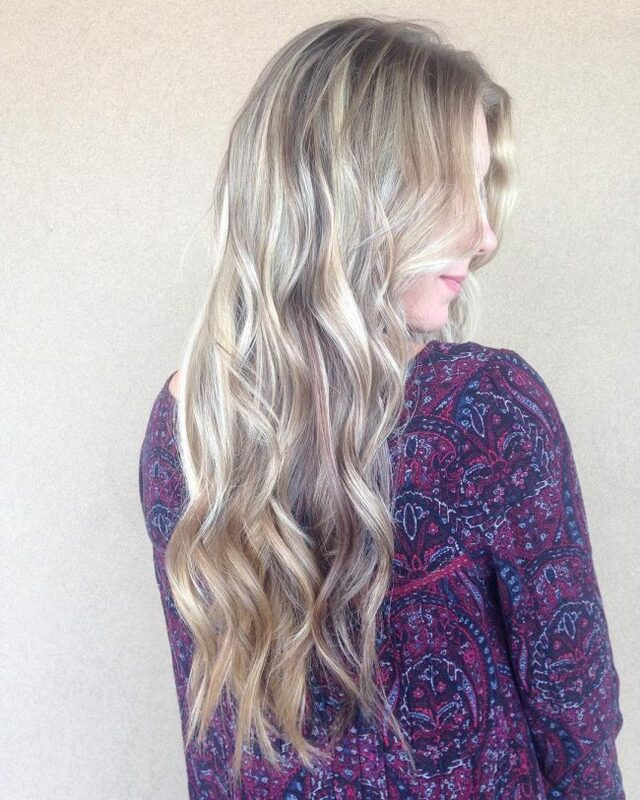 Several shades combine in this style to give the beach waves their perfect tone. Apart from the natural base shade the most dominant hues in the style are the hand painted golden blonde and an ashy brown, and they give the wavy locks their distinctive tone. 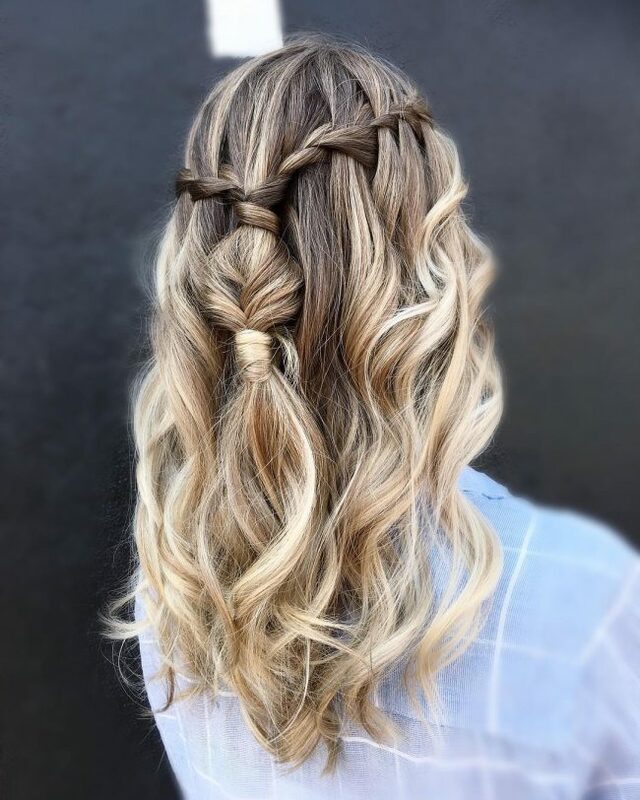 The waterfall braid on these long textured and loose curls is the first thing that will catch your attention, but there is more to the design than this. 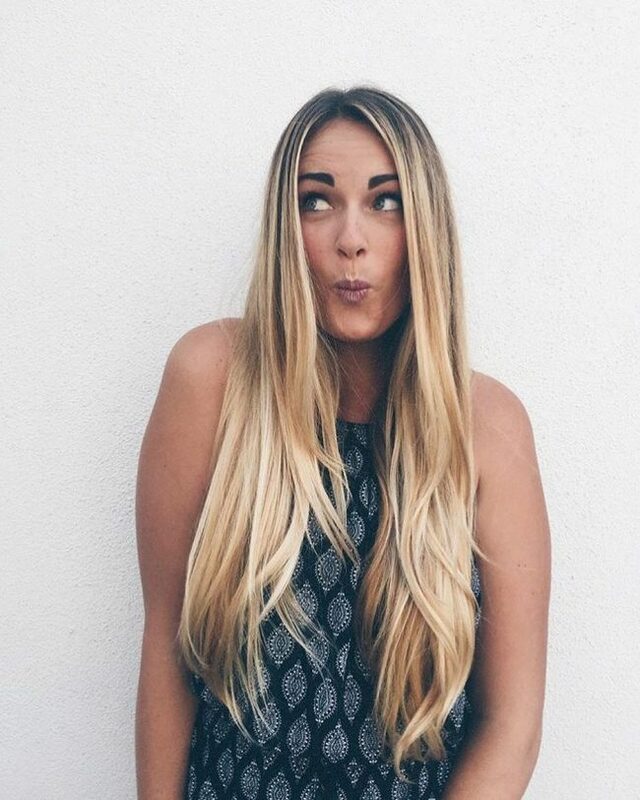 These strands have an adorable balayage shade with an ombre pattern that makes them look magnificent. It entails introducing a soft blonde shade with a hint of honey brown to the natural brunette locks to create a unique overall tone. A blend of brown and blonde will always guarantee you a perfect color for your hair, and this is why many ladies prefer this combination. And if you freehand paint the two shades in a sombre color pattern like this one, you can be confident of getting a look that will make you stand out. 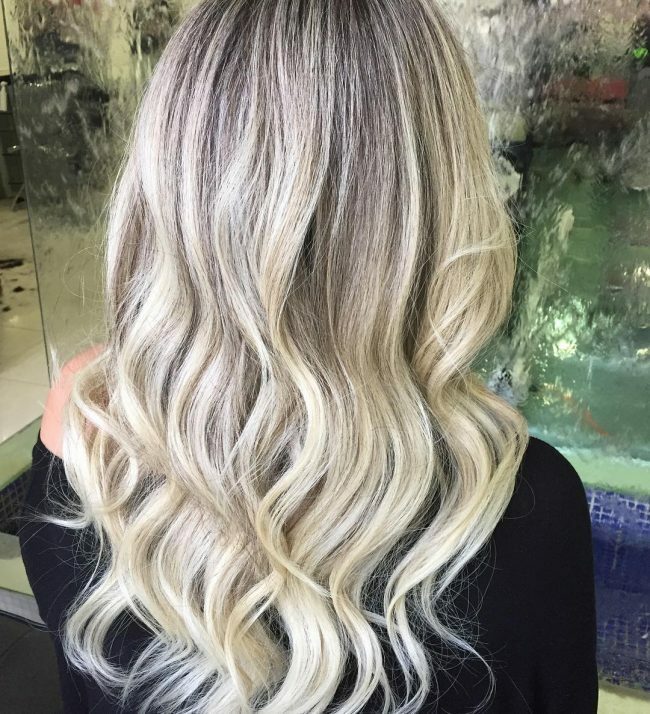 Blonde balayage couldn't look more natural than this, and the elegance of this style should explain why many ladies want to try it out. 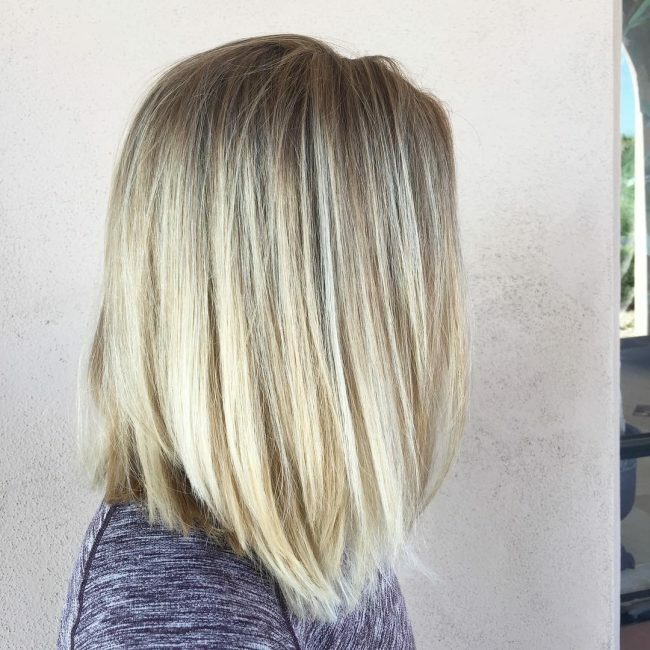 The bright highlights on this style are chunky, but they still look striking and natural. And if you finish by styling with a side sweep and by layering the textured lock you will look majestic. Although this hair has an excellent texture and some curls on the ends its color is what makes the headdress top notch. But, it is very easy to replicate once you figure it out because you only have to introduce some subtle strawberry blonde highlights on the brunette locks and hand-paint them to ensure that they look natural. Once you have the textured and edgy cut, the next and most important step in creating this look is to introduce a blonde shade to your natural dark brown locks. 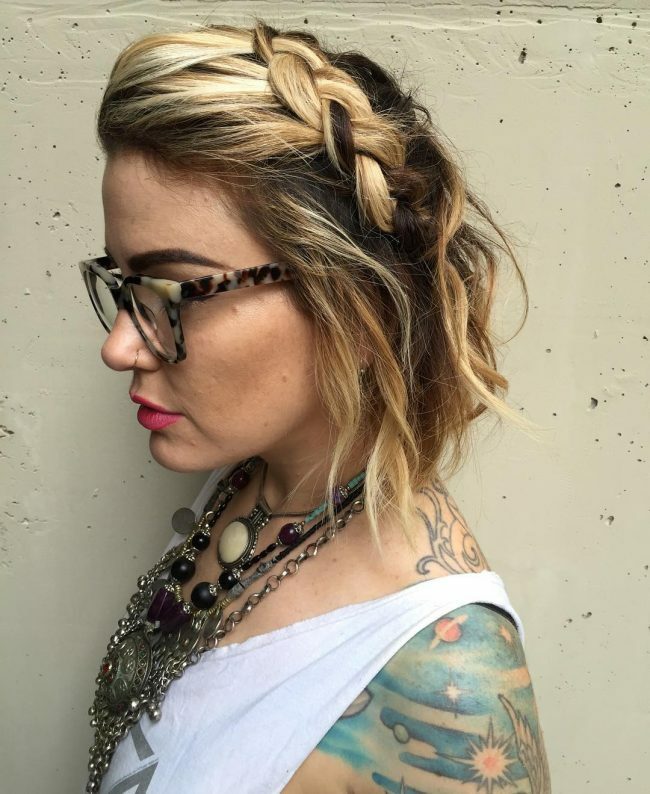 You should use balayage to do this as it will give you a neat and natural look and finish the style by weaving the locks into a messy side braid. 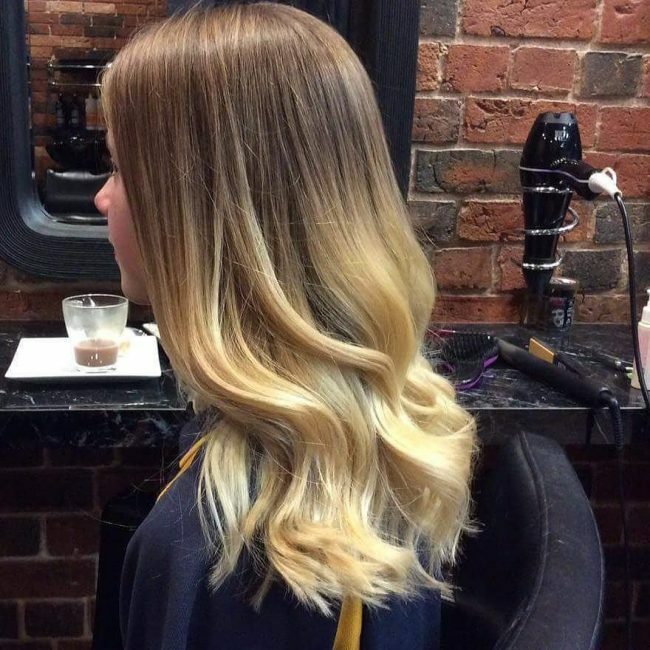 This stunning rooty blonde appearance comes from having a balayage dyeing throughout the head. 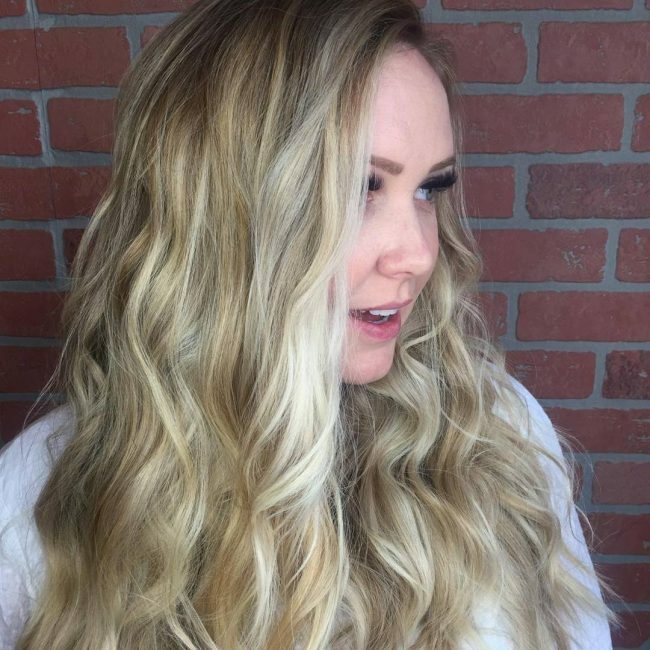 In creating this look, you should have a honey blonde base shade and then transition it in a sombre pattern to a golden blonde shade to form the exquisite color design. 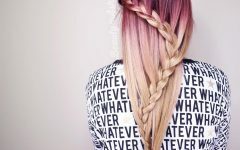 Blending various shades on your hairdo is very trendy, and this is more so if you use bright ones like in this style. This fashionable hairstyle has multiple shades such as strawberry blonde, brown and brunette and they blend flawlessly to give the long textured and wavy locks a pleasant appearance that will make a woman look extra chic. 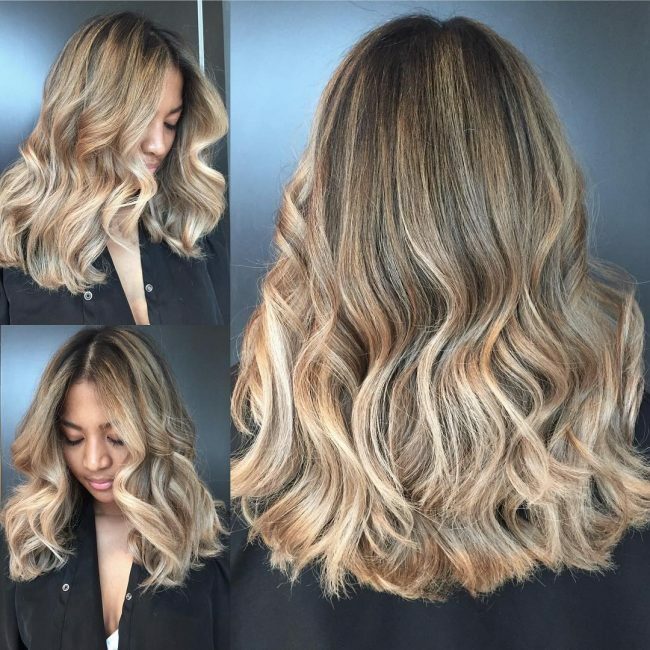 If you have a medium size or short hair, then you should concentrate more on the roots and ends to get a perfect balayage dyeing like this one. 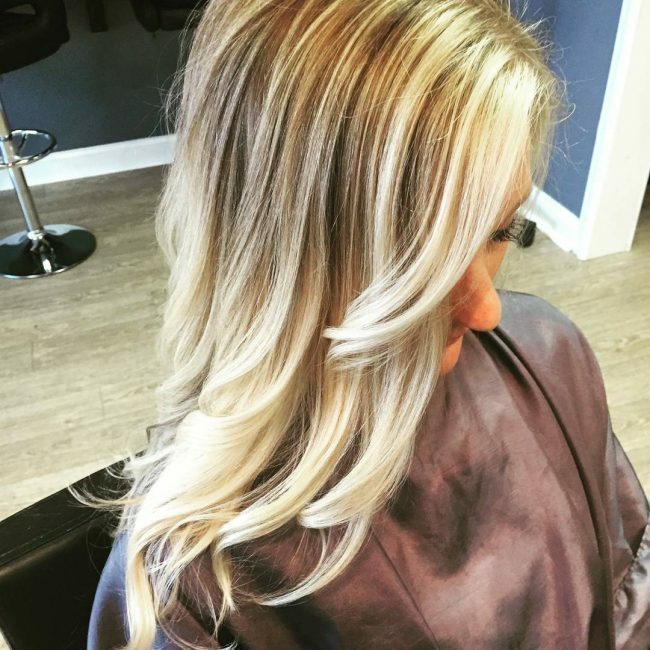 This style entails shadowing the roots and giving the ends an ashy blonde shade. The locks also have some textured curls that add some dimension to the beautiful color pattern. Your thick luscious locks still require some color to make them look refined and modern. 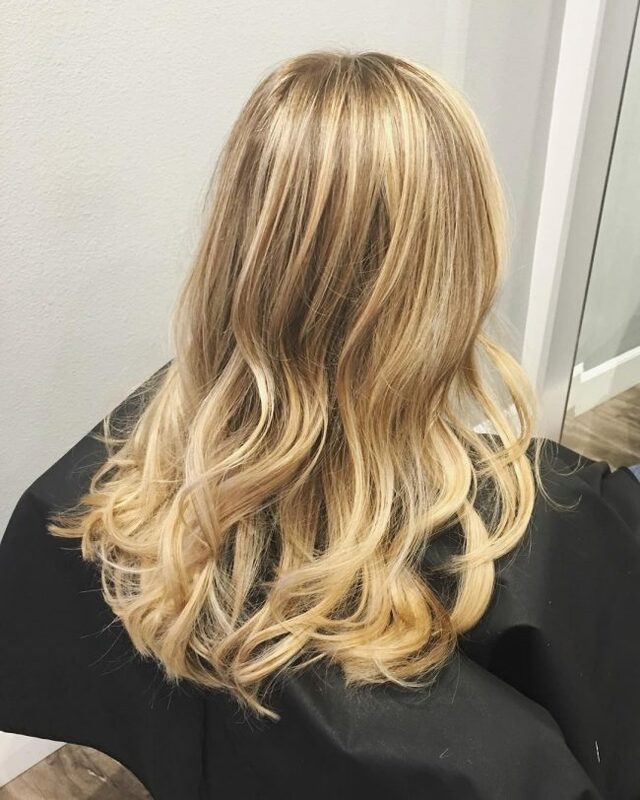 These particular ones have a beautiful blonde balayage that entails transitioning from a dark brown base to a bright blonde shade on the ends to create a lovely ombre pattern. You should enhance the appearance by styling the hair into a face frame. The dark roots are the first thing that you need to get when creating this freehand painting color design but this should not be a problem if you have a natural black hair. Once you have the dark roots, you should paint your thick mane with light blonde and brown highlights to create a glamorous appearance. Chopping your strands to a shoulder-grazing length is an excellent idea because it makes them easy to color. 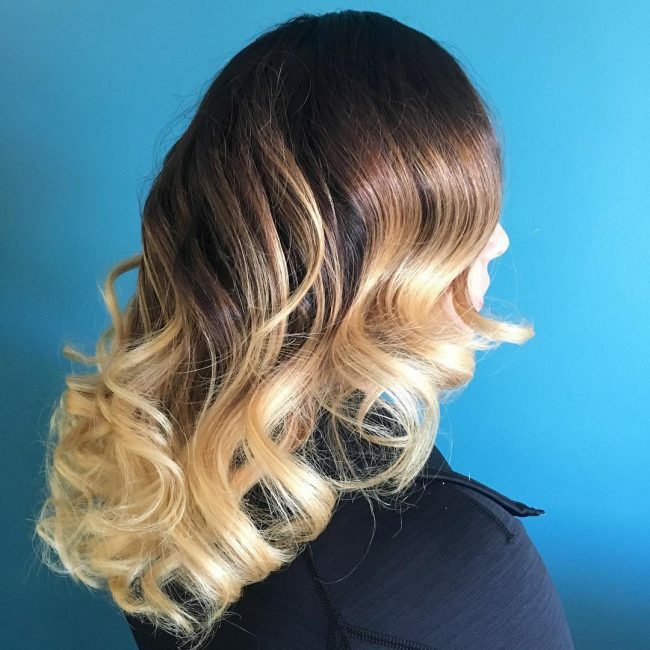 It also makes everything straightforward for you because you only need to hand-paint an ombre color pattern that transitions from a dark brown base to a sandy blonde hue to give the summer waves a perfect tone. The brightening effect of strawberry blonde is irresistible, and this is because it has an immense effect on your hairdo. These long locks may have some beautiful waves and texture, but the introduction of the freehand painted strawberry blonde and light brown highlights on the hair is what gives them their adorable appearance. The length and thickness of this summer mane make it look magnificent. But hand painting some blonde highlights on the natural honey shade gives the hair an exquisite shade that takes the overall appearance a notch higher. 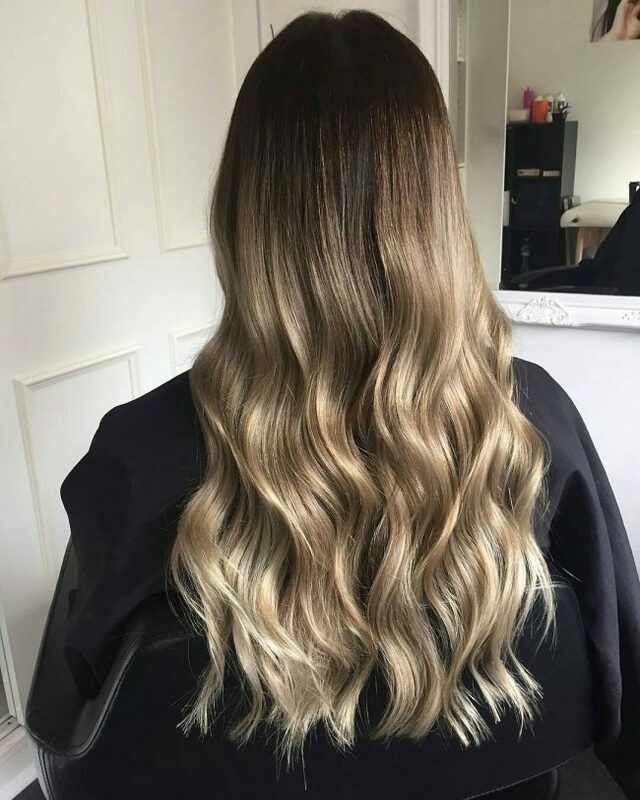 If you already have some beautiful golden locks, a good idea would be to spice them up with some hand painted highlight so as to enhance your appearance. And if you want them to look as charming as these then you should dye them with a blend of dark brown and blonde. The ombre transition from the dark brown shade to the light ash blonde hue on the lower curly half of the hair is splendid. 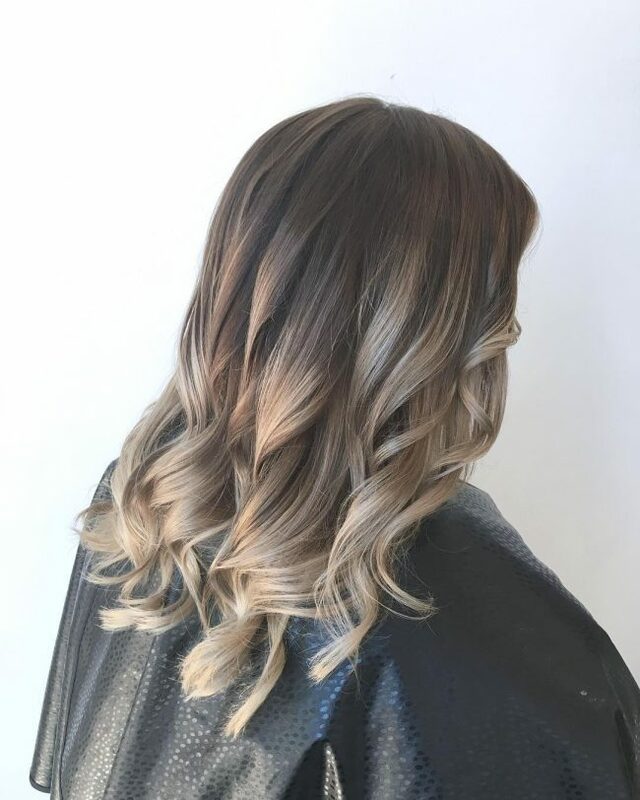 However, you can only achieve this color perfection through balayage, and you should also finish the style with a spray to give your beautiful colors a dazzle. Natural brunettes have a very easy time when coloring their strands because they already have a vibrant color on their locks. 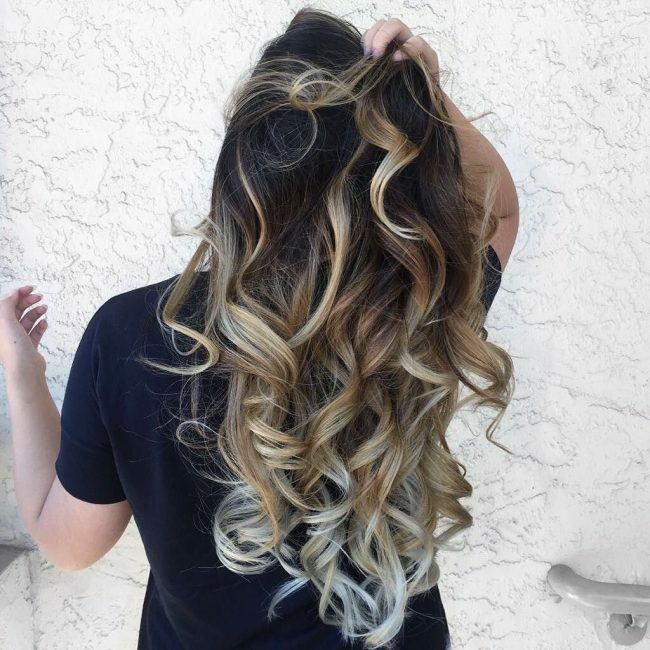 However, balayage can still help you to spice up your locks and to do this you only need to hand-paint your brunette locks with blonde and brown streaks. The short choppy haircut is the first thing that you will need when creating this lovely hairdo. You should then give the shoulder-grazing strands their beautiful balayage coloring which is what makes them look elegant. And for this, you will need to hand-paint a bright blonde hue with a hint of brown. Having several freehands painted shades of blonde in your hairstyles will give you an impressive multidimensional look like this one. This style also has an appealing natural look and most people will think that it is your real hair color. And for styling you should sweep back your hair in some sleek layers so as to blend your shades well. 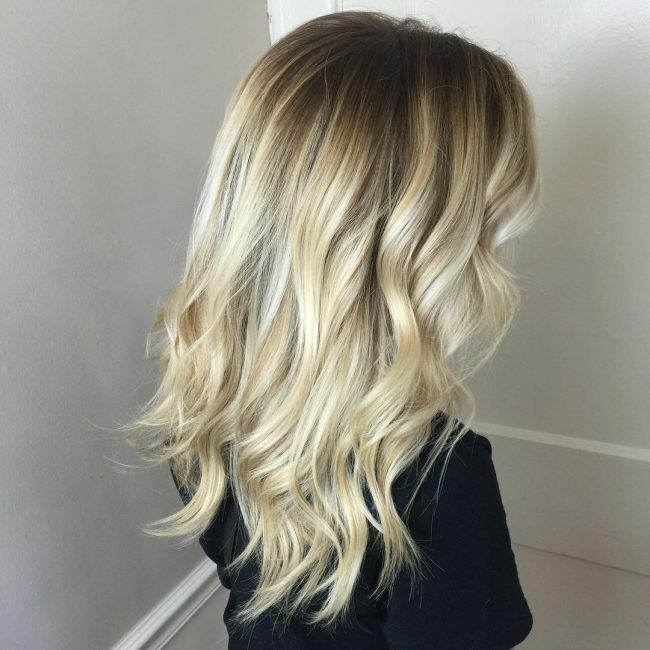 Even if you already have a beautiful hair color like caramel you can still spice it up and make it trendy by hand painting some blonde babylights like these ones. You should paint them at the front because this not only adds some class to your hair but can also accentuate your facial features when you style the locks into a face framing design. 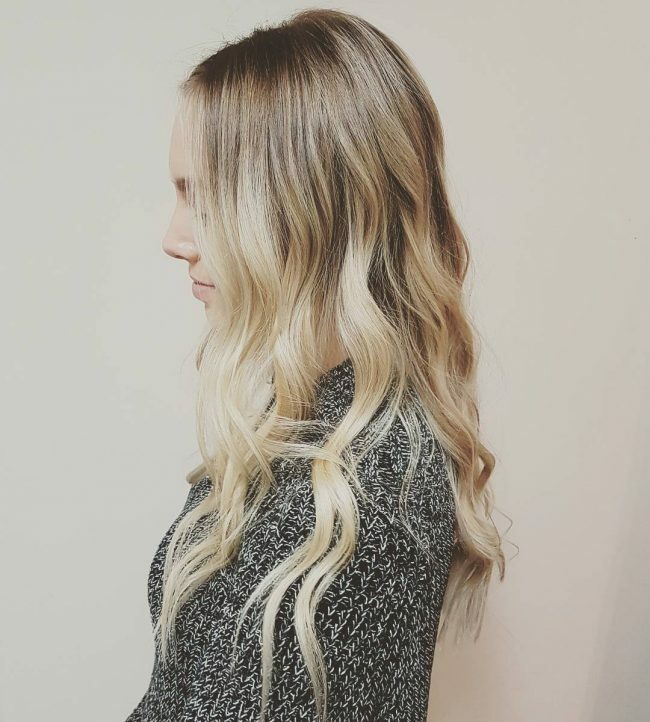 Blonde balayage is the way to go if you want to create a natural looking hairstyle that you can wear for any season and also one that works with any skin tone. And with the many blonde shades and variations available you can be confident of finding a hue that goes with your tastes and preference.